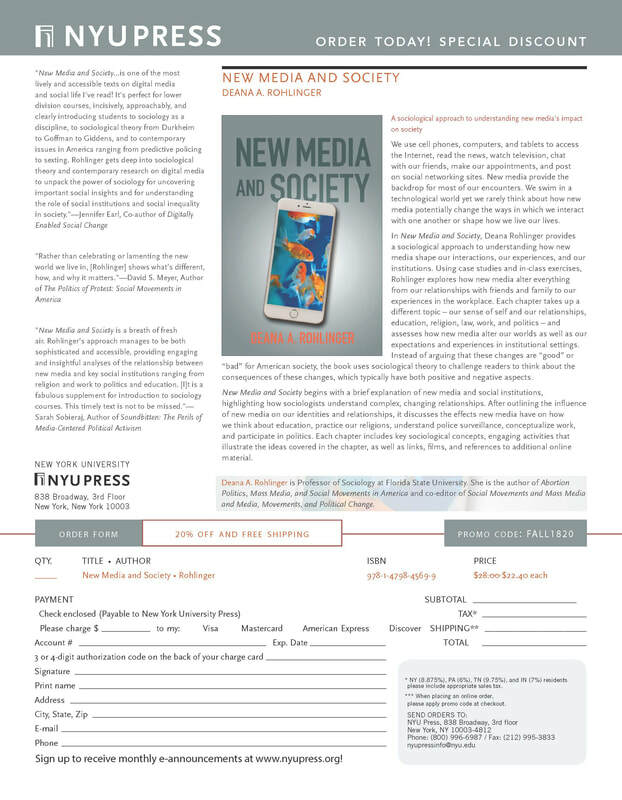 "New Media and Society by Deana Rohlinger is one of the most lively and accessible texts on digital media and social life I've read! It's perfect for lower division courses, incisively, approachably, and clearly introducing students to sociology as a discipline, to sociological theory from Durkheim to Goffman to Giddens, and to contemporary issues in America ranging from predictive policing to sexting. Rohlinger gets deep into sociological theory and contemporary research on digital media to unpack the power of sociology for uncovering important social insights and for understanding the role of social institutions and social inequality in society." "The Internet and social media have changed virtually everything about social life. Rohlinger's indispensable book explains how. Rather than celebrating or lamenting the new world we live in, she shows what's different, how, and why it matters." ​"New Media and Society is a breath of fresh air. Rohlinger’s approach manages to be both sophisticated and accessible, providing engaging and insightful analyses of the relationship between new media and key social institutions ranging from religion and work to politics and education. Not only does it fill a gap in many sociological courses on media, it is a fabulous supplement for introduction to sociology courses. This timely text is not to be missed."